Day Two of Samanvay offered a treat of sterling discussions to the audience. 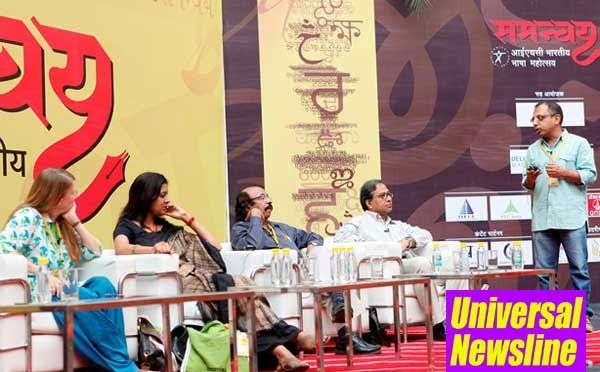 The opening session of the day saw the panellists voice their opinions on the schism between serious literature and popular literature in India. Cartoonist and poet Rajendra Dhodapkar said that in the ecosystem of literature, all kinds of literature − good serious literature, not-so-good serious literature, good popular literature, not-so-good popular literature − share a symbiotic relationship. Writer-translator and Premchand Samman Awardee Prabhat Ranjan added that earlier the serious as well as the popular, both the literatures were deeply entrenched in the lives of the people but now there is a fissure between the two and their extent varies. Satyanand Nirupam, who is editorial director at Rajkamal Prakashan group and also the Creative Director of Samanvay, added that his house had the works of all kinds of writers, ranging from Ved Prakash Sharma to Munshi Premchand, on one shelf. He further said that lately, in the Hindi literary world, the publication of one’s work is hailed as the greatest achievement by the author. No thought is given to where the publication is going and who is reading it. Anu Singh Chaudhary, the author of ‘Neela Scarf’, stated that she is a creation of the social media because blogs and social media were the first to give her space to write. She also urged the people to not typecast writers of popular fiction or make them literary untouchables. The session that took the baton from the first session revolved around the principal theme of the Festival: Translations Transnations. The panel comprised of writer Arundhati Subramaniam, essayist and academic Fakrul Alam from Bangladesh, translator Gillain Wright and eminent Malayali poet and Director, School of Translation Studies and Training, K. Satchidanandan. The challenges in the translations were discussed at length in the session which was moderated by Arunava Sinha. In progression of the schedule, Mr. Ashok Vajpeyi was conferred the Samanvay Bhasha Samman Award by Rakesh Kacker, Director of IHC. The jury for the award comprised of Uday Narayan Singh, noted linguist and Vice-Chancellor of Vishwa Bharti, academic Alok Rai, famous poet and playwright Sitanshu Yashaschandra, K. Satchidanandan, and Raj Liberhan, former director of IHC. In his thanksgiving speech Vajpeyi recounted words of his teacher who had once told him that live as an administrator (since Vajpeyi belonged to a family of administrators) but die as a poet. The following session on the languages of Bastar − Halbi, Dorli, Bharti et al – saw a stirring discussion on the endangered languages of Bastar between Dorli translator Kattam Sitaram, writer-editor Rajeev Ranjan Prasad who is known for his book Aamcho Bastar, poet Rudra Narayan Panigrahi and Vikram Kumar Soni whose role in the revival of Halbi has been monumental. The next session discussed the dichotomy between Tamil writings from Tamil Nadu and Tamil writings from Sri Lanka. Historian-writer Ambai, who moderated the session and Tamil theatre personality A. Mangai read two poems of Sri Lankan poet Theepachelvan. Multifaceted Kutti Revathi, who is a lyricist, poet, activist and doctor, was also a part of the discussion. corporates are consciously making the language impure. Rakesh said that the language of the ruling class is always the dominant language. India Habitat Centre’s Annual Languages’ Festival Samanvay is held in collaboration with National Book Trust, India. Delhi Press and REC Limited are partners to the festival while IIFCL, PTC India Limited, Bank of Maharashtra, ONGC Limited, and DD Bharati are associate partners. Pratilipi Books and Rajkamal Prakashan Group are content partners. Our outreach partners are Aatish Theatrical Society, Pratham Books, and Oxford University Press. Le Communiqué Consultancy is handling the public relations for the entire Festival.